If you blend fine Italian food, a substantial wine list, a charming atmosphere, and local family style attention you get a place like Mancuso's Italian Table. 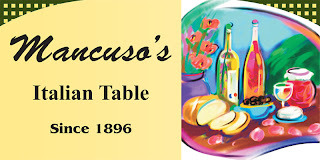 Since 1896 is in reference to the Mancuso's family presence in Houston, while the restaurant is about two years old. A clever play on a family heritage. You can read their story here. Chef Greg has put together a menu filled with classics and updated regional Italian dishes. Daily specials revolve around the fresh ingredients of the season. I have to come clean with you because Chef Greg is my brother. I've watched his career blossom from prep cook to head Chef in only a few years. Greg's training came in the kitchen with the fortunate guidance of classically trained Executive Chef John Boehm. 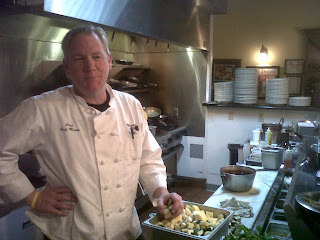 Chef John created a kitchen for Greg to master the essentials, hone his skills and create innovative dishes. It's clear that Greg took this opportunity and ran with it to become the Chef he is today. During my most recent visit we were treated to perfectly pan seared sea scallops with a pears, apples, and basil oil. Fresh gulf snapper with sweet pepper sauce, shrimp in pino grigio butter, and herbed risotto was my pick for the night. A local favorite is the Ted's trio. You get a healthy portion of ravioli, lasagna, and meat ball spaghetti. Owners Jerry Mancuso and Doty Martel are often seen visiting with diners adding to the family charm of this little gem on Voss in Houston. If you want spectacular Italian food set in a warm and inviting place, Mancuso's can't be beat.